The question that is potentially obvious is- why? I am not trying to point a finger here. 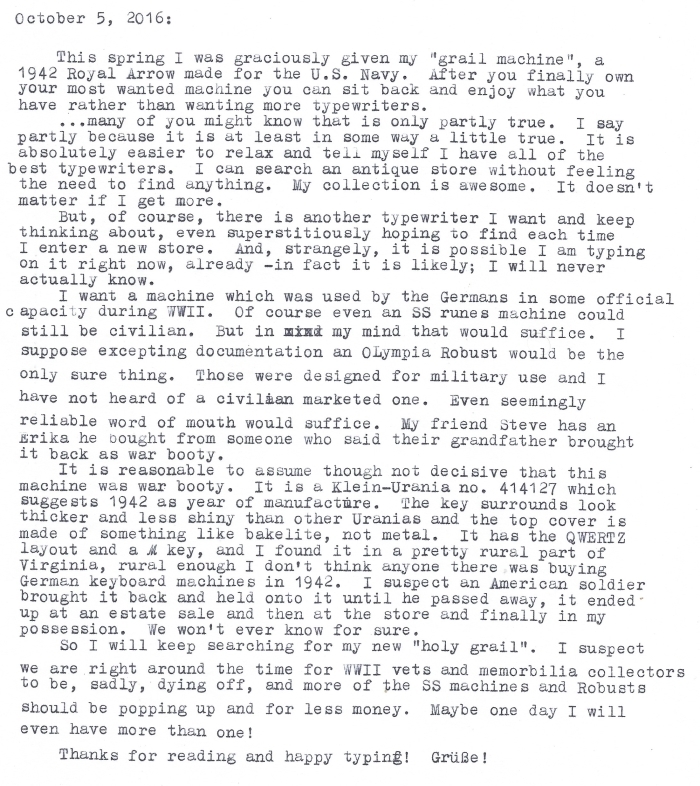 I know there are two sides to this discussion but why would a machine used by an SS officer be of interest? The same reason anyone would want a US WW2 typewriter, or a typewriter used by a famous novelist, or used at a significant newspaper, etc. It has a really cool provenance and it's a fascinating artifact. 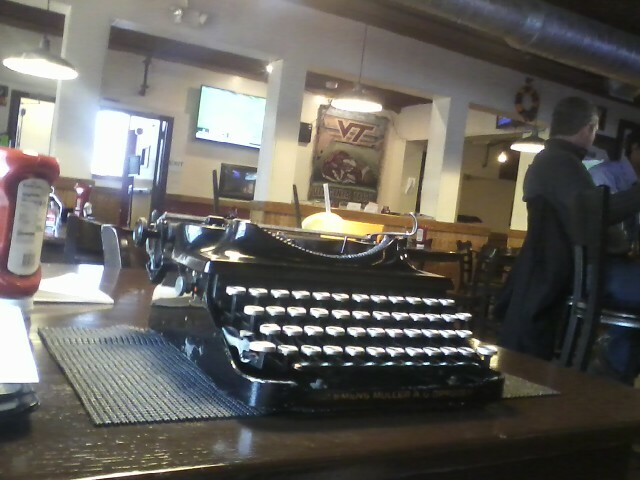 Basically the reason I want one is the same reason anyone wants any specific typewriter. It's not poisonous or anything, it's a hunk of metal from a really interesting place in time and it be would be so neat to have it. I have heard countless arguments against owning such a thing, and some from some people I really truly respect, but honestly those arguments still all sound pretty ridiculous to me. Hopefully if one of those folks who knows me finds one they can hook me up since they don't want it. I have two US Navy issued machines, a Royal from 1942, and a Underwood from 1941. It is awesome you have the Remington! War is war, and history is told by the winners. There were good Nazis, there were bad US soldiers. The big difference is that in addition to fighting a war the Germans also attempted a genocide. Because of that one can pretty clearly argue who are "bad guys" and who are "good guys". I guess since typewriters are a huge area of interest for me it seems reasonable I would really want a Nazi typewriter. I'm not interested in hoarding Nazi stuff for the sake of having Nazi stuff. I just really love typewriters and it so happens some very cool and distinctive typewriters were used by the Nazis and I REALLY want to own one! Neat machine! These little Uranias are very idiosyncratic compared to the portable typewriter norm at the time. I've said it before, but I don't want any SS typewriters, not because of some general argument but simply because they would bring me no pleasure—only reminders of cruelty and tyranny. Of course, they are historically important and I can understand why someone might be interested in adding such an artifact to a collection. That's an opinion of course, related to personal preference! I have heard others say that no one should have SS runes machines and they should only be in museums, and that is what I think is ridiculous. The Urania is a great design, it seems really easy to do maintenance on and is very open and simple. It's a shame they didn't make more and it did not evolve into something more advanced later (at least not that I am aware of). I am quite taken by the simplicity of it. I got two SS typewriters (in fact i'm selling one of them) and dont feel any "guilty". I'm lucky to own these Groma's Modell N thatni really love, they're beautiful, nice for typing and harmonious in there shapes. Anyway.. Nice post. I saw you on the typewriter database! Thanks for reading my blog! i didn´t notice that this is your "blog", i was on mobile. I feel like you on this post, i catch my "grail machine", and it was in first acquisition, how lucky i was, then 1 month later, in another deal searching for some books i found my second one just dont believe yet! My next step is "to adopt" a Corona 4, i saw that orange on typewriter database... and get crazy. First i got to sell my "Groma II", to bank the new one and 1 book that i got my watch list. I certainly will follow you here.